I just wanted to share a few page kits that are now available at Page-Kits.com. You can head over and grab yours while supplies last. PLUS ALL page kits are on sale with many at super clearance prices! Here is a close up of the bunny holding the egg shaped background photo mat. Here is a close up of the cute little bunny topper. Here is a close up of the die cut title. Here is a close up of the ADORABLE baby chick with bunny ears paper piecing. This kit will come with both title blocks...."Baby's First" or "Day Fun" with the Easter die cut so you can create either title for your layout. Here is a close up of the little froggy on his lily pad paper piecing. 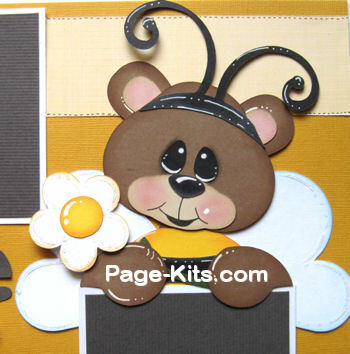 Here is a close up of the bear as bumble bee paper piecing. 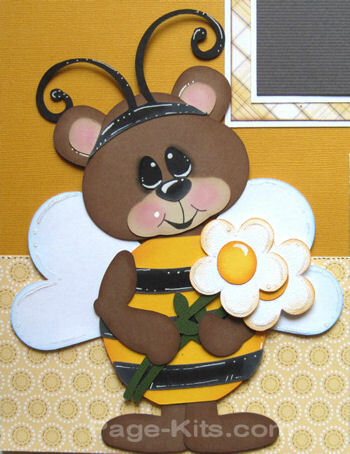 Here is a close up of the bear as bumble bee topper. 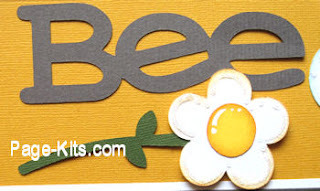 Here is a close up of the bee title with one of the flower die cuts. Thank you for stopping by and making us a part of your crafty day! Awesome LO's!!!! Thanks for sharing. Love the bunny and Teddybear bee.